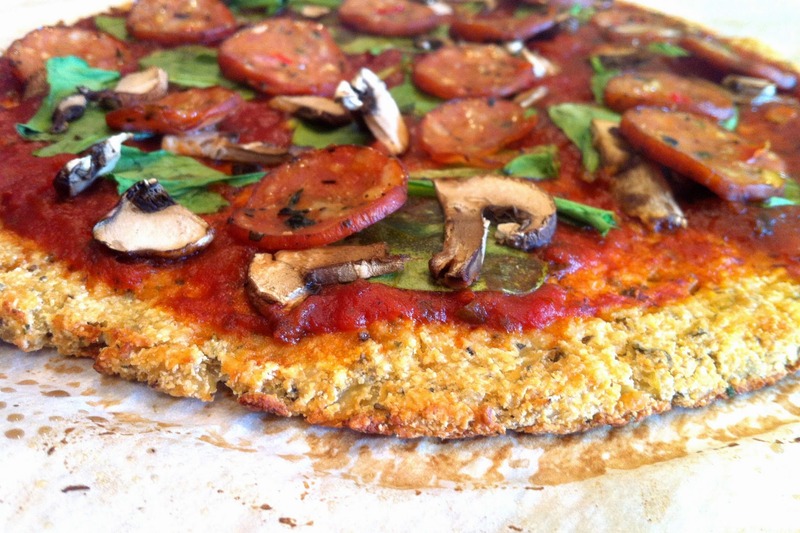 I have been perfecting my cauliflower pizza crust for a long time now. So many of my favorite recipes have been on-the-fly, lucky, thrown together ideas that turned out perfect the first time... This one, however, was not so easy. There are so many "healthy" pizza crust recipes out there on the internet~ but I've never been able to find the one that ticks all of the boxes. They're either too soggy, too bland, or packed with shredded cheese (or other non-Paleo ingredients). 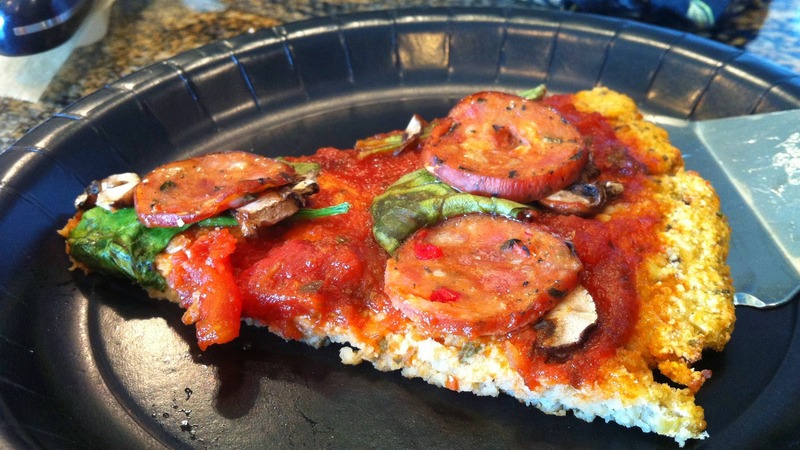 I love the idea of a veggie crust for pizza, so I kept on my mission to come up with my own recipe. I couldn't be happier with it, and am super excited to finally share! 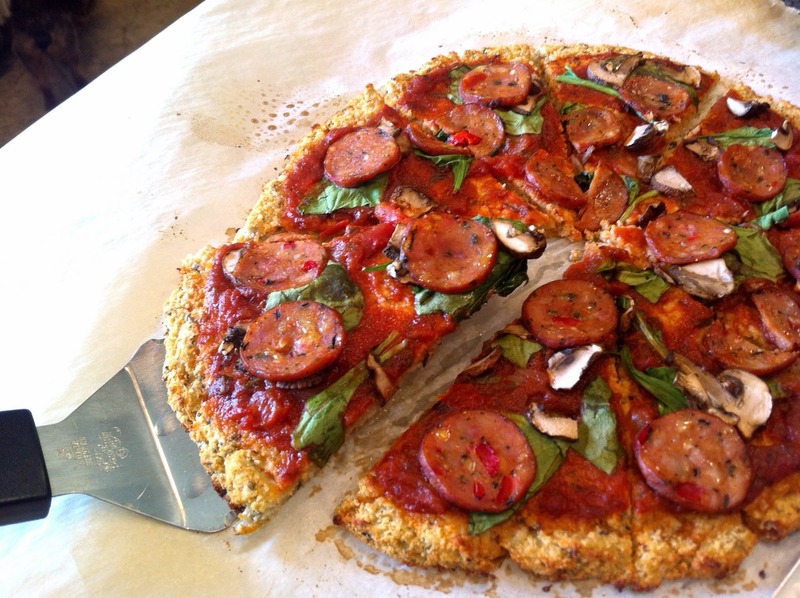 After many almost-perfect attempts, here is my gluten, dairy, soy, and sugar-free Cauliflower Pizza Crust. Perfect for my Paleo friends out there, and something fun to try even if you're not a Paleo eater! There are endless possibilities with this basic crust recipe... Switch up the sauce, the toppings, or even the shape; I think mini pizzas would be fun! p.s.~ Scroll to the bottom of the recipe for nutritional information.... you'll be amazed at how few calories this amazing crust contains! Here is my pizza crust fully topped & ready to enjoy! I used Trader Joe's Organic Tomato Basil Marinara Sauce, then sprinkled with fresh spinach, crimini mushrooms, and thinly sliced Italian sausage. Microwave the cauliflower in a large bowl for about 4 minutes (add an extra minute if preparing from frozen). Allow to cool to room temperature. Transfer to a cheesecloth, thin dishcloth, or stack of paper towels (I needed about 3 layers) and squeeze out the majority of the moisture over the sink. Transfer the cauliflower back to the bowl, and mix in the egg, coconut flour, and spices. Spread the mixture onto a baking sheet lined with parchment paper, and pinch into a 10-inch round circle (or whatever shape you like!). Bake for 15-20 minutes or until the top begins to turn a light golden brown. Add toppings of your choice (sauce, veggies, fully cooked meats), return to the oven, and bake for an additional 10-15 minutes, or until toppings are fully cooked and the pizza is warmed through. *TIP: Double the recipe to make two crusts, bake them, top as desired, then freeze for later! Now you've got a frozen pizza~ just thaw & bake at 425ºF until heated through & golden brown. This is great Jessie! I can't wait to try it out. I just started my second Whole30 and was looking for new recipes. Thanks! Round 2 will be better. I would say about 1/4" to 1/2"... mine was about 10 inches round & the thickness was perfect! How many people does each pizza typically feed Jessie? Any tips for someone who doesn't have a microwave? You could try sautéing it over low until it gets translucent, then allowing it to cool! This was amazing! I don't have a microwave so I did it in the frying pan worked great! I'm excited to try the balls next time. 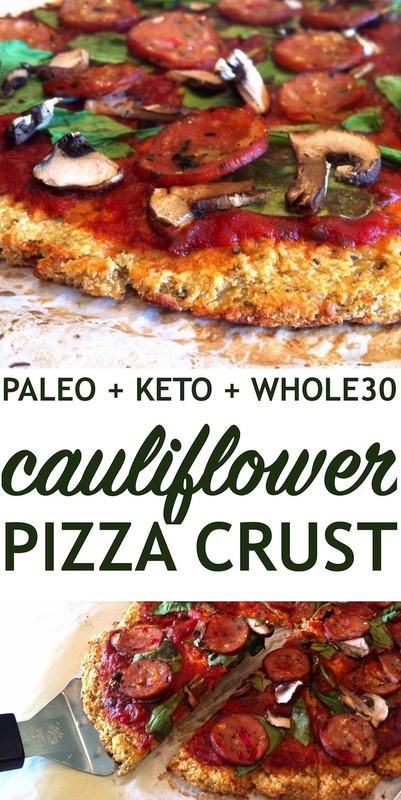 Thank you for this I don't eat cheese and you were the first cauliflower crust I could find that didn't call for cheese. So happy to hear good feedback from you Lisa! Thank you for taking the time you comment! The "pizza bites" are one of my favorites because they are so easy. & totally agree on all of the recipes out there calling for cheese... it's so unnecessary! Hi Jessie, do you think Almond Flour can be substituted for the coconut? My husband and I loved this recipe.....made it tonight with sautéed sweet onions, mushrooms, green pepper and crumbled bacon. Thanks Jessie! To remove the moisture after microwaving the cauliflower, I used a nut bag which worked beautifully. Your beef enchilada bake was amazing also and we plan to make the cauliflower biscuits and pizza bites next. What would you suggest for step 1 for those of us who don't own a microwave? I can't quite tell what the purpose of this step is - softening the cauliflower? So maybe steaming it would be the no-microwave modification? Could you use egg whites? Sure! I would use two egg whites to replace one whole egg. Can I chop the cauliflower or so I need to shred? Hey if also like to know if almond flour or something other than coconut can be used as a substitute? I've developed an allergy to coconut! & Maria: you could try chopping it really fine! Just baked these--I doubled the recipe, squeezed the heck out of the cauliflower, added one extra egg and one tablespoon psyllium husks for extra binding. (We're heading to a grilled pizza party and I could not risk them falling apart on the grill!) They turned out great--thank you! I’ve made this twice - both times excellent. I used frozen cauliflower rice from Trader Joe’s with eggs whites and whole wheat flour. Baked at 400 and came out perfect. 1.5 hours from start til eating - a little workout wringing out the cauliflower (used cheesecloth), but well worth it. A++ recipe, thanks!